Committee to elect chairman of the party, list of candidates for the Knesset to be determined by Central Committee members. 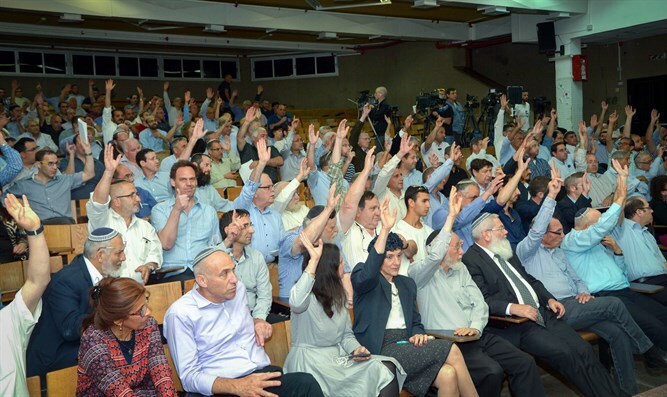 The Jewish Home Central Committee will convene next Wednesday to approve an amendment to the constitution of the Jewish Home, which will determine that the chairman of the party will be elected by a "public council" of 13 members, including public figures, elected officials and representatives of party institutions. Should the public council and the central committee not elect a woman as the party's candidate in the first or second spot on the list, the public council will select a woman who will be placed in the third spot on the list. "In addition, there is a concern that the integrity of the elections will be harmed due to the fact that there are many members who supported and continue to support the members of the faction who left the party," explained the Jewish Home. "We would like to propose, by temporary order, the process of assembling a list that contains a mix of different methods that will help to create an optimal list in the unique situation which we are facing." Jewish Home director general Nir Orbach said, "The movement is facing a difficult challenge today. The reality that has been imposed on us in recent days is particularly challenging and we are confident that we will emerge from it strong and united. We are embarking on a short and intensive journey to create a process that will win the support of the party's institutions and create a list that will fulfill the hopes of the party members and represent the diverse constituencies that comprise the religious Zionist public."